A long walk with excellent views and increasing interest from the mountains and ridges further along the route. The walk back along the road, although picturesque, can be tiring at the end of the day, a bike could be used to shorten this section. Fairly boggy approach. The hills give mostly excellent going with a couple of sections of more awkward boulders. A good stalkers path is used on the descent. No public transport to the start of the walk. Parking just off Glen Strathfarrar road between Deanie Power Station and Loch a'Mhuillidh where track heads north. Open start point in Google Maps for directions. The road up Glen Strathfarrar is private and vehicular access is strictly controlled at the locked gate at Milton Cottage near Struy and a maximum number of 25 cars allowed in a day. In the summer months the gate is open from 9am to between 6 - 8pm depending on the month and closed all day Tuesday and until 1.30pm on Wednesdays. In the winter access must be arranged in advance through Mountaineering Scotland. 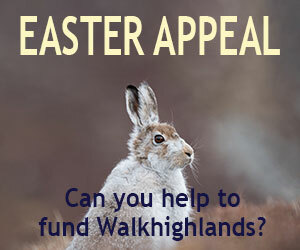 See their page on Strathfarrar access for further details. There are no access restrictions for walkers or cyclists and there is a car park near Milton Cottage. To start this walk, drive along the Glen until a flat grassy area between Loch Beannacharan and Loch a' Mhuillidh is reached. Here a track heads north and there is parking on the grass just off the track. Follow the track uphill. Continue on the track past the small dam on the stream and continue uphill. Where a small path branches off to the left, continue for a very short while on the faint track and follow a clearer path to the left - they both eventually join up as they follow the Allt Coire Mhuillidh upstream. At this point the second Munro of the day, Carn nan Gobhar can be seen straight ahead, a rather insignificant looking grassy dome, and the first summit, Sgurr na Ruaidhe, slightly to the right looks very easy, but much of the ascent cannot be seen from this angle. After crossing the first side stream, climb up the easy grassy slope in a north east direction - there is a faint path but at times this is indistinct and boggy. Before you reach the top, a stone shelter is reached and then the summit cairn a little further on at 993m. The walk to the Bealach nam Botaichean in a north, west north direction is on lovely spongy moss and grass which is very easy going. There is a small steep section to the actual col and then a long and straightforward pull up first north north west and then as the steepness eases, westwards, to the summit of Carn nan Gobhar. The last few metres are covered in boulders and there is a small cairn at the north edge at 992 metres where there is a good view of the route up Sgurr a'Choire Ghlais. From the cairn, retrace your steps along the ridge south over the boulders a short way and then follow the pleasant grassy ridge southwards and then south west as it steepens to Bealach Sneachda at 865m. The steep pull up the other side is straightforward with a small path and a boulder section near the top. There is are two large cairns on the summit (1083m) and a trig point in between. There are good views north to Glen Orrin, Strathconon and to the Fannichs beyond. From the northern cairn, you can descend the rocky ridge or bypass the boulders by heading west from the trig point and then heading back north to the ridge to continue north west along the clear ridge. The descent to Bealach Toll Sgaile is straightforward and as the ridge narrows and the views of Creag Ghorm a'Bhealaich improve makes an impressive section of the walk. On the ascent the summit of Creag Ghorm a'Bhealaich can be bypassed but the tiny detour to the top is worth it for the dramatic views down into the coire. From here there is only a small descent before the final pull to the summit of Sgurr Fhuar-thuill at 1049m. From the summit continue west, just beyond the col at 987m a stalkers path leaves the ridge to the south west - a small cairn marks the spot. From here there are great views across to the slabby face of Sgurr na Muice with Loch Toll a' Mhuic below. Follow the clear path as it descends steeply at first and then traverses below the ridge and descends to the eastern side of the Loch. Keep following the path until it crosses the stream and later becomes a track and follows the course of the Allt Toll a' Mhuic downhill with some impressive waterfalls and pleasant birchwoods. Eventually the track emerges onto the Glen Strathfarrar road. Turn left here and follow the road for the 6km to return to the start, passing Braulen Lodge on the way.